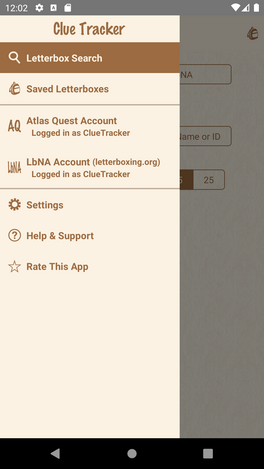 Clue Tracker for Android is the newest letterboxing app for Android® phones and tablets. Using the app, you can quickly and easily find Atlas Quest and LbNA boxes, view maps, record finds, save and organize itineraries of letterboxes and much more. Letterboxers can access listings from both Atlas Quest and LbNA. Find nearby letterboxes based on the current location of your Android® phone or tablet. Search for boxes by location, box name, and box ID. View detailed letterbox information including last found date, series details, and notes. Show letterboxes on a map and get directions to a box. Save clues and other letterbox information for offline use. Organize saved letterboxes into your own lists and reorder boxes to create custom itineraries. Android phone or tablet with 4.1 (Jelly Bean) or newer. Clue Tracker is brought to you by Pearl Crescent.